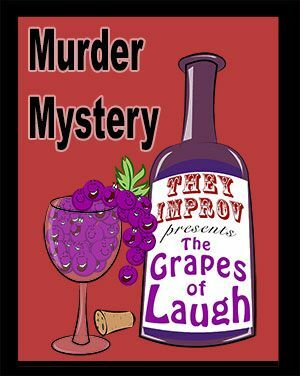 Murder mysteries for wineries and vineyards have a very different feel than shows at other types of venues. While we have the more traditional dinner shows, we also have options that work with tastings, mix and mingle events and team building programs for corporate events. We have a variety of approaches to handle different sized groups as well as for changing circumstances. THE STRAIGHT MURDER MYSTERY: The standard of the genre, the "Straight" murder mystery involves 4-8 actors creating mayhem at an event. They are "in-character" as guests arrive and continue to entertain and spiral their plots as the evening progresses. Towards the end of the meal, usually, there is a crescendo event with the death of the victim. At that point, the detective takes over to humorously interrogate audience members to divulge information about the evening. Audience members are then allowed to provide their answers for the hope of winning prizes. There are also "Ambush" versions where the audience doesn't know that there is a show going on until the victim dies. While normally this is done around a meal, it can also be done with heavy apps or just as an activity. THE CAMBRIDGE SOLUTION: This is a version where 4-10 audience members, or of your staff, are used as characters in the investigation. We do a simple workshop to help them along and work to make them look like rock stars. This helps build teams and keep the costs down. This can be done around a meal or as an activity. THE CLUE PARTY: This is a mix-and-mingle event usually conducted as a cocktail party game. It's great as an ice-breaker an is used to get people to get some face time with one another. FRICK AND FRACK SHOW: More of a stand-up comedy routine, a mystery is generated on the fly using information provided by the audience along the way. In comedy, this is referred to as "crowd work" and involves give and take between one or two of our comedians with members of the audience. THE TRIAL: A relatively new and experimental event, we have a two-tiered show. The opening is the investigation of the characters and discussing the circumstances leading to the catching of the killer. The second step is have an audience-interactive trial where witnesses take the stand, people are the prosecutors and our actors play a variety of characters. MYSTERY WEEKENDS: We also provide a variety of options to take an entire weekend. This option is fully customizable depending on your desire. THEMES: There are many themes available for the different options. Most of them are available for all of the options, but you should contact us to confirm your choices. Common themes include the 1920's, the 1980's, Mobsters, Millionaire's Mansion, Spies, Santa, etc. Contact us to find a theme that meets your needs.